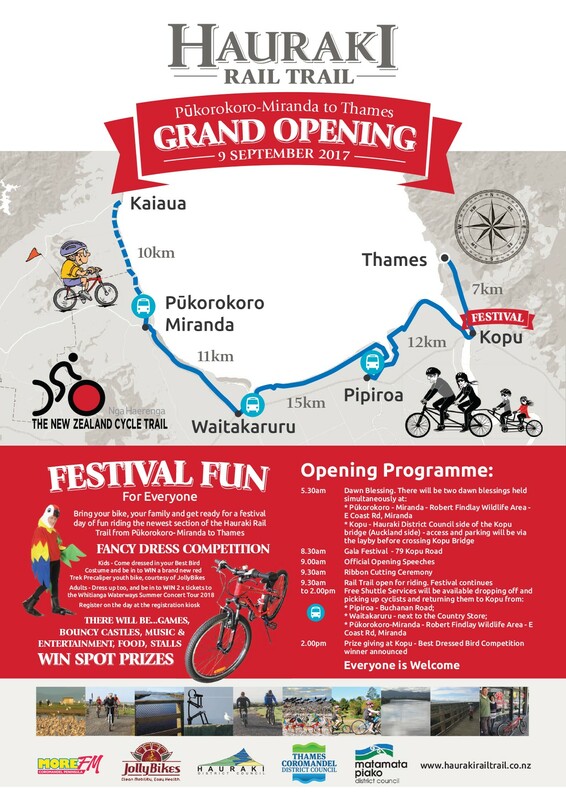 The grand opening of the Pukorokoro-Miranda to Thames section of the Hauraki Rail Trail will take place on Saturday 9th September. Bring your bike and your family for a festival fun day of riding, with activities for all ages and plenty of prizes to be won on the day. Rail Trail manager Diane Drummond says it will be a fun, family event with lots of activities for all ages. “I’ve got such a spring in my step about this section. It’s is going to be a great asset on the Rail Trail. I’m so pleased it’s going to be open in time for spring,” she said. “The scenery and birdlife along the way is incredible." The day kicks off with simultaneous dawn blessings at 5:30 at each end of the new section: At the Robert Finlay Wildlife Area in Pūkorokoro-Miranda (at the bird hide carpark) and at the west end of the Kopu Bridge (parking is available at the layby on that side of the bridge). Fun day formalities begin at Kopu at 8.30am, with a Rail Trail ride (or walk) kicking off at 9.30am. Shuttle services will be available at various points along the way for one-way riders, or those only wanting to do part of the Rail Trail. A new bike, courtesy of Jolly Bikes, is also on offer for the person who turns up wearing the best bird costume on the day. “Everyone’s invited, so put a ring around this date in your calendar and start working on your bird costume,” says Drummond. If you are interested in having a market stall at the opening in Kopu or at one of the shuttle service pick-up locations, please contact Lisa D'souza at lisa.dsouza@tcdc.govt.nz or phone 07 868 0329.